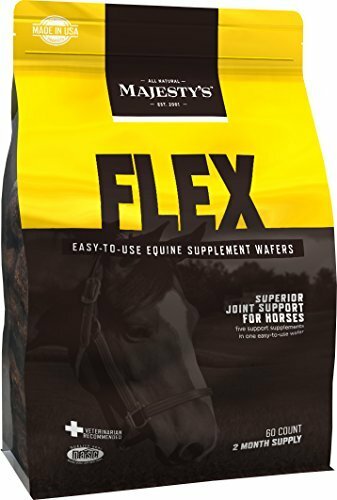 Majesty's Flex + for Horses with 7500 mg Glucosamine and 3000 mg of MSM for the support of bones, joints and cartilage. 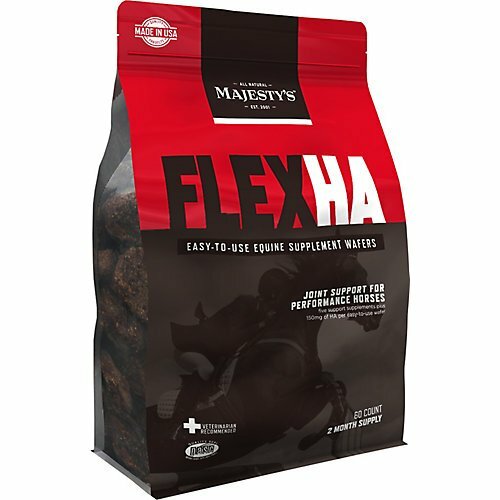 A no-bake wafer, easy to use, you now have no need to separate and stall horses, mix feed with supplement powder and liquids just give them a wafer saving you time and money. 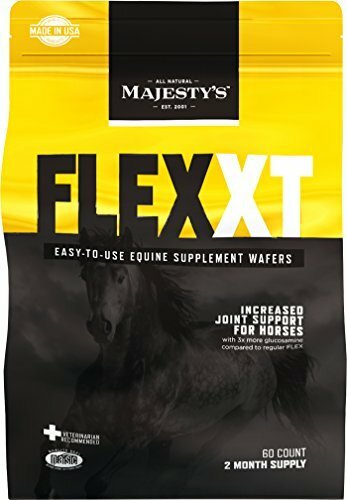 Majesty's Flex XT Wafers (formerly Flex+) Wafers Increased supplement levels for horses that just need more joint support. 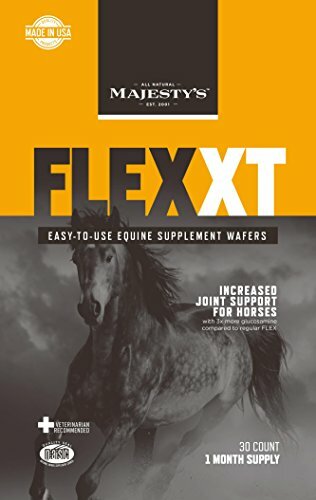 Majesty's Flex XT Wafers uses the same supplements as the regular Majesty's Flex Wafer, but with three times more Glucosamine, plus increased levels of MSM, Yucca, and Vitamin C. Features: Veterinarian-recommended Five-in-one joint support Palatable and easy to feed Made in the U.S.A. Item Specifications: Directions for Use: One or two wafers per day as directed by your veterinarian. This is a nutritional supplement and is not to be mistaken for a treat. 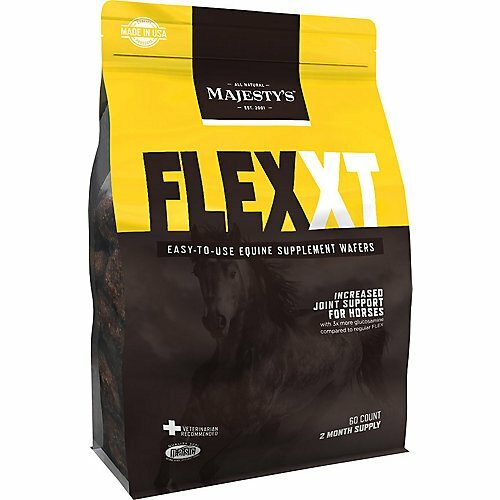 Please Note: Product is undergoing a rolling packaging change to the new name of Flex XT (formerly Flex+). Formulation has not changed. 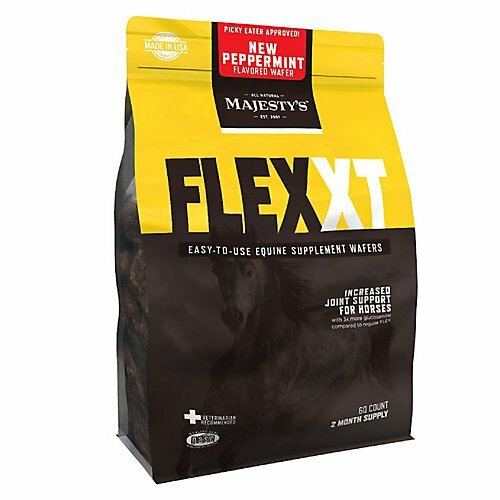 Majesty's Flex XT Peppermint Flavored Wafers Now with peppermint flavor, Majesty's Flex XT Wafers use the same supplements as the regular Majesty's Flex Wafer, but with three times more Glucosamine, plus increased levels of MSM, Yucca, and Vitamin C. They're great for horses that need more joint support. Features: Peppermint flavored for picky eaters Veterinarian-recommended Five-in-one joint support Palatable and easy to feed Item Specifications: Size: 3 lb. (60-day supply) Ingredients: Glucosamine KCL (Shellfish Source): 7500mg MSM (Methylsulfonylmethane): 3000mg Yucca Extract (Yucca Schidigera): 1750mg Chondroitin Sulfate (Chicken Cartilage): 600mg Ascorbic Acid (Vitamin C): 750mg Inactive Ingredients: Apple Bits, Apple Sauce, Barley, Cane Molasses, Corn meal, Cracked Wheat, Flax Seed, Hulled Millet, Potassium Sorbate (preservative), Rolled Oats and Whole Wheat Bran, Inorganic Carrier, Natural & Artificial Flavor Components, Mineral Oil. Directions for Use: One or two wafers per day as directed by your veterinarian. 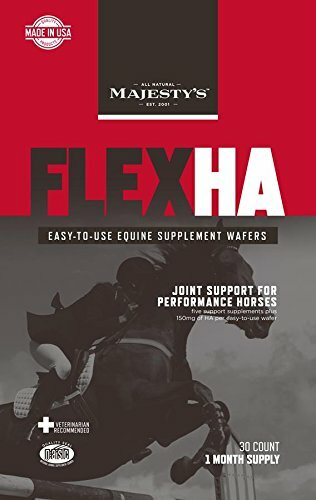 Copyright © Wholesalion.com 2019 - The Best Prices On Majestys Flex Wafers Online.